After my reveal of the kitchen makeover at Flip 5, I thought I was done with projects in that room. 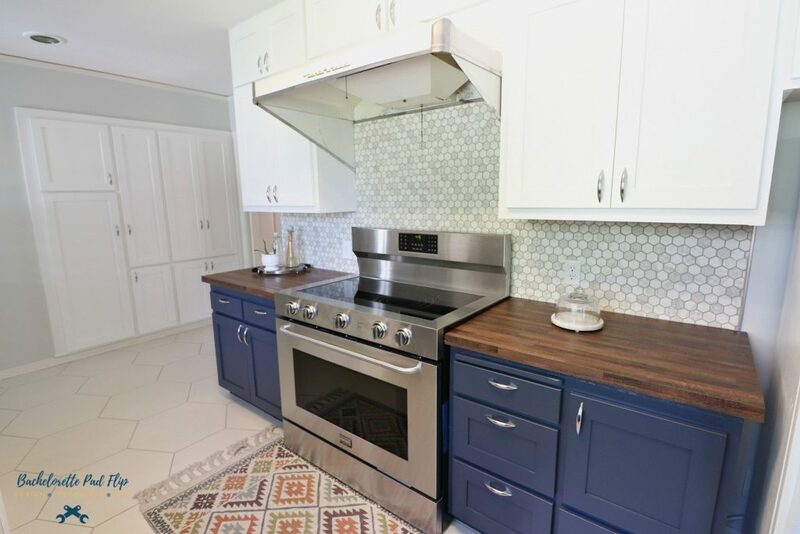 I loved so much about the newly renovated kitchen, but what I loved most was the original character I was able keep with the stove and vent hood. They were original from 1951…and still worked! It’s true what they say, they just don’t make them like they used to. The stove had made it well over half a century. Imagine the amount of meals that stove has prepared. The families it has seen come through that kitchen. The stories it could tell. On a rare night that I was actually cooking, one of the electric coils exploded. It exploded with such force that it blew a literal hole through the skillet and seared the skillet to the coils. I had already had an electrician inspect the wiring on the stove, and, as expected, it was original with the potential for some safety hazards. But I loved the character the stove brought to the space. Unfortunately, after the mini-explosion, I didn’t feel safe using it anymore. It pained me to admit it, but the original stove had to go. So with a heavy heart, I rolled the old (HEAVY) stove outside. One of the smart decisions I made when purchasing this home was to ask for a home warranty. It has come in so handy- like when my pipes burst in the crawl space, and my home warranty covered the repair. Appliances are also covered under home warranties, so I filed a claim with my home warranty company. 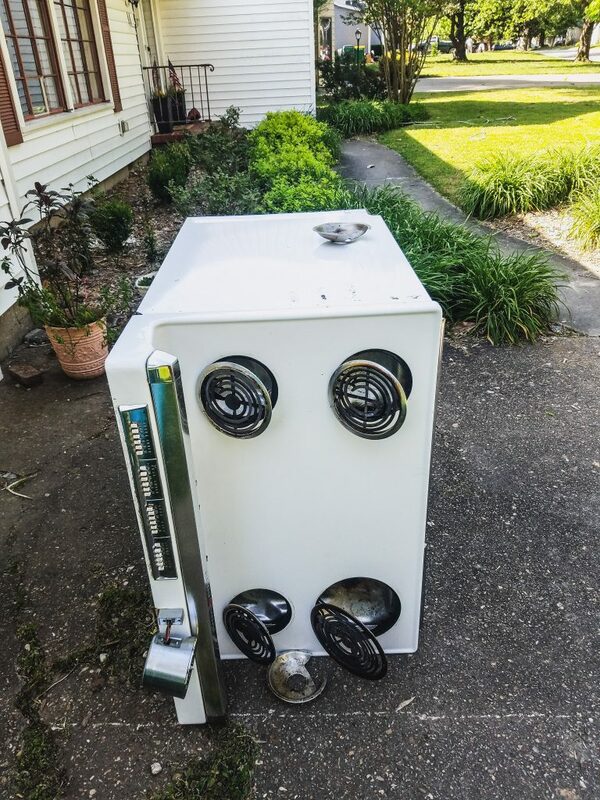 When shopping for a replacement, I quickly discovered a pretty significant fact about the original stove– since it was older, it was an odd size width of 40″. That is no longer a standard width for ranges. In fact, there is only one company that still makes a range in a 40″ width. It’s Frigidaire. So I literally had zero options on the new range– unless I wanted to RE-remodel my kitchen to reduce the width of the cabinets. Obviously, I didn’t want to do that. Since I really had zero options for the replacement, I found a local company that could order the replacement stove. 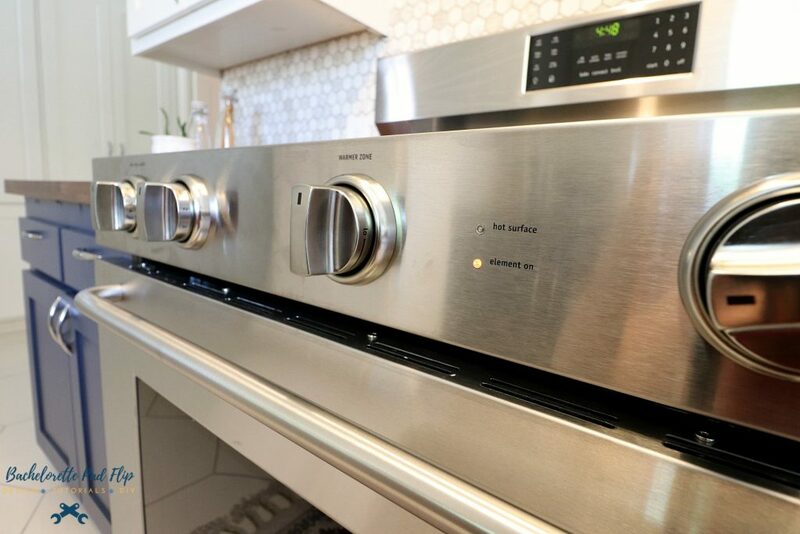 The Frigidaire 40″ electric range comes with a staggering price tag: over $3,000. Keep in mind, I had just shelled out $10,000 for this kitchen remodel. Also keep in mind, I rarely cook. So to sink $3,000+ on a stove was a gut punch. But again, this is where my home warranty saved me again! Since it was a custom order replacement, they were unwilling to pay for the entire replacement, but they split it with me and paid almost half. Let me tell you, that helped the medicine go down when writing the check for that new stove! While I loved the character and charm the old stove brought to the kitchen, I absolutely hated the fear I had with it. Zero lights worked on it. One of the ovens didn’t work. Many, many times I’d be done cooking and not realize I had left a burner on. There was no hot zone light or knobs to turn to trigger my memory. Instead, the operation switches were “piano keys,” and I was always afraid I’d forget to look at the keys to see if all the keys were in the off position. And sometimes I’d forget. That made me very nervous! So as small as it is, I was so excited that this new stove had not only an element-on light, but also a hot surface light that stays on until the glass top is cool. Something I took for granted with all my previous stoves was that my pans and cookie sheets actually fit. 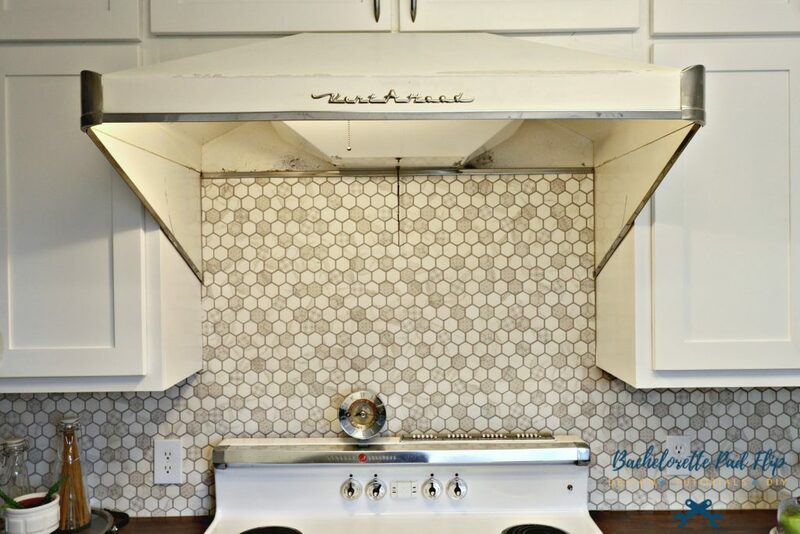 In the original midcentury stove, there were actually two ovens. The smaller over didn’t work and the “larger” oven was only wide enough to fit smaller sized cookie sheets. I didn’t do a lot of cooking, so it wasn’t a major inconvenience to me, but it was a little annoying. With this extra wide 40″ range, I can fit an entire army in there! And it comes standard with three cooking racks instead of two. This range has so many features. In all honesty, I will probably never even use half of them.It’s both convection and regular bake. 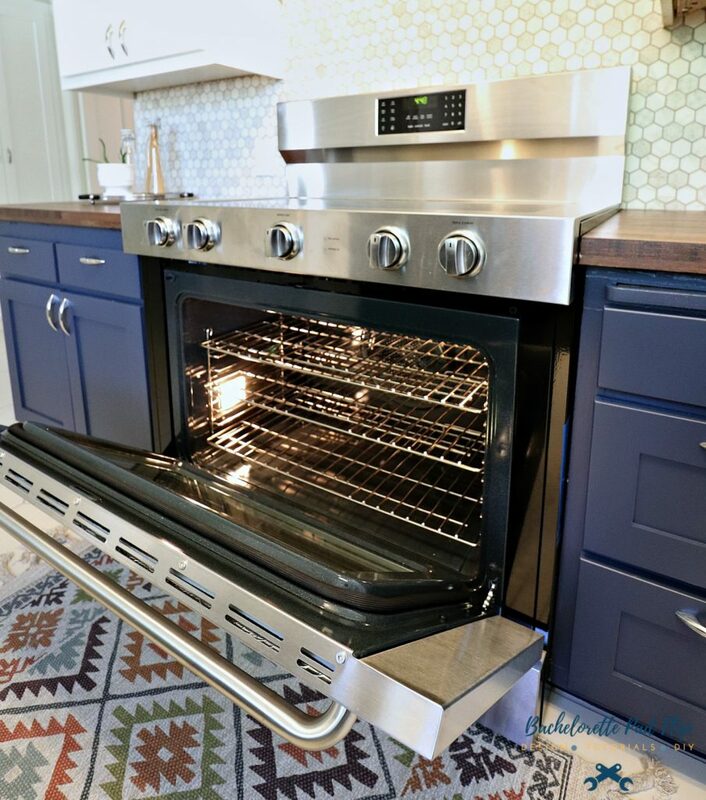 It has adjustable triple size cooking rings, warming zones on the glass top, self-cleaning, delay start, and more. And it comes with a 1 year warranty, plus I purchased a 10 year extended warranty which will be transferable to buyers– when I opt to sell. But even though this fancy gadget looks good in my kitchen, it’s certainly not my first choice. Obviously I would still prefer to have the original. The charm that the original range brought to the space is now gone. This is now a very modern (large) element in a midcentury kitchen. And while they’re ever popular, I typically hate glass top stoves. They’re a pain to keep clean, and certain cookware can’t be used on them. But I guess the good news is that I don’t do a lot of cooking, so hopefully it’ll stay looking new! 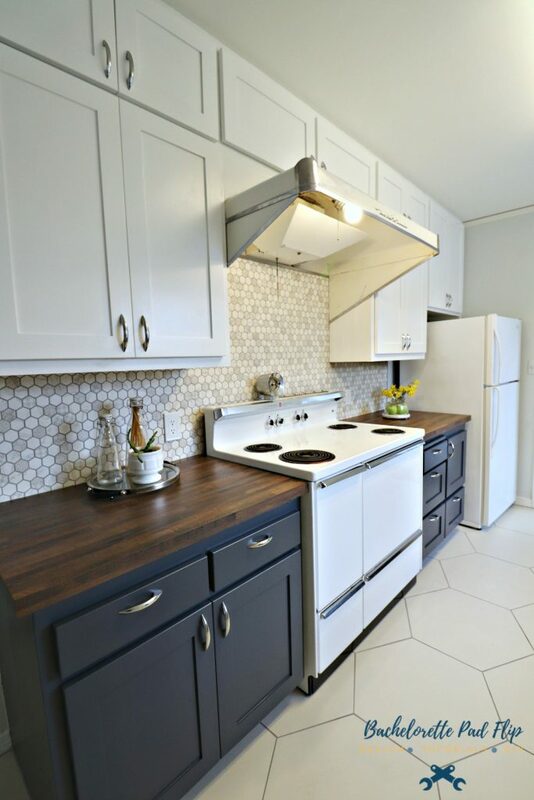 The look of the kitchen has certainly changed since the reveal. It’s definitely an upgrade. I’m still adjusting to the new look, but I will say this- if you’re buying a home (ESPECIALLY an older home), insist on a home warranty! This year alone they have covered my burst pipes and exploding stove! So now that I have this fancy stove, I guess I better get to cooking! I may be trying Hello Fresh soon, but what are you favorite easy recipes I should try?! Also, send me all your DIY tips for keeping glass tops clean! It is a beautiful stove….but I agree about the charm of the old one…too bad you had to get the new one. 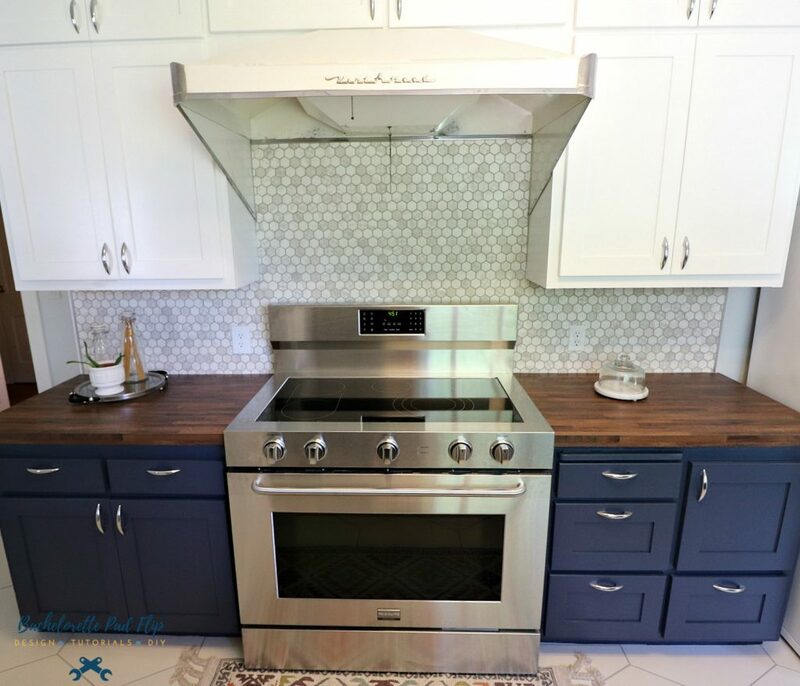 I too purchased a glass stove top range….what a terrible choice!!! I wish I did not….because you are right…it is a pain to keep clean. BUT I am curious when you stated that you can NOT use certain cookware on it……LIKE WHAT? I would love to hear what you can NOT use on it….please and Thank you. Thanks in advance…….and I am SO going to miss your flips…..you were a pleasure to watch out for…and a inspiration to women! I’ll still be doing some adventures- just not flipping (for now!). They said all cookware has to be smooth bottom– no ridges in the bottom of the pan and to be very careful with cast iron. They also said not to “slide” the pan back and forth while you’re cooking b/c it scratches it. I clean my glass top stove with soap and water. If something is burnt or stuck on, I use a razor blade. Its quick and easy, and no scrubbing or scratching. I have an induction cooktop I love. I use WEIMAN “glass Cook Top” cleaner. 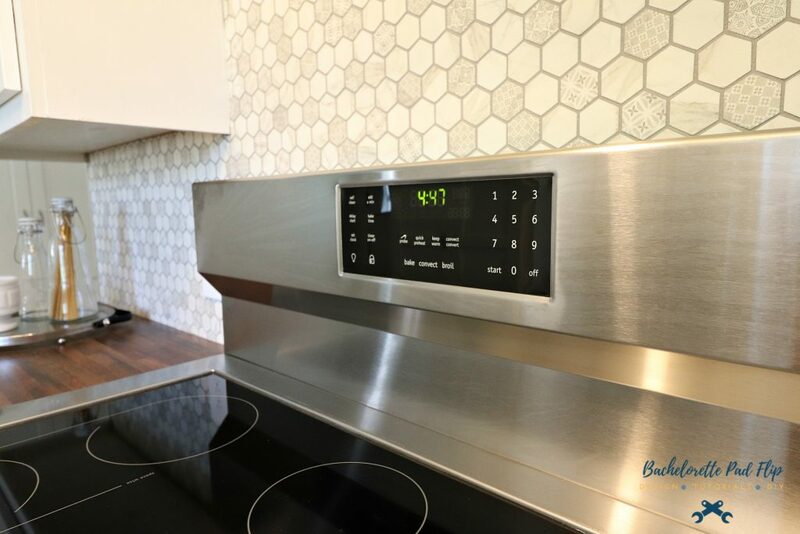 One reason to love a smooth cooktop is that it gives you extra counter space. I find it so much easier to clean than the drip pans. Induction is also easier to cook with and faster than gas. After the soap and water to clean, my Granny wouldn’t rest until she sprayed with white vinegar and water to rinse to soap off. She had a stove similar to your white one and it never did “yellow”. And dried it with the tea towel that had just dried her dishes.